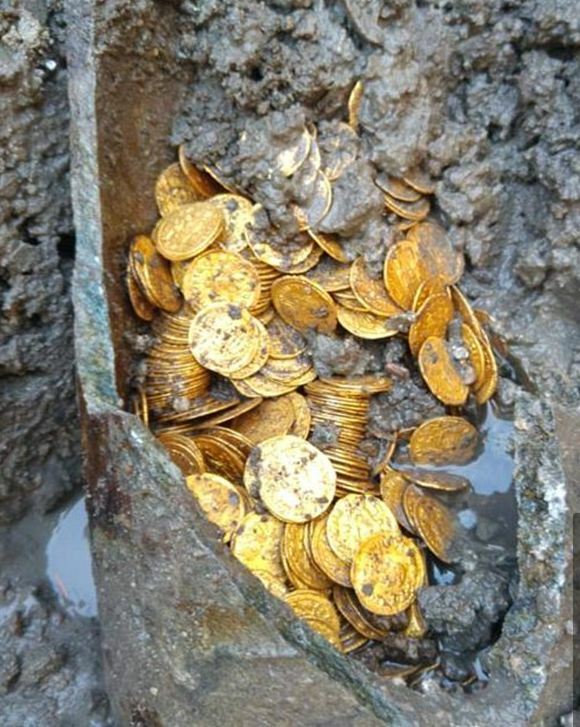 There were more than 100 gold Roman coins discovered in a buried hoard in the Cressoni theatre in Como, north of Milan. What I have examined from the photographs supplied to me, is that this is a hoard from the virtual fall of Rome. The coins I identified were from the Puppet Emperor of Ricimer, a Germanic general who ruled Rome through puppet emperors going into the end of the Western Empire. His power emerged in 461AD until his death in 472AD. The official fall of Rome took place in 476AD. After Ricimer’s death, the Germanic King of Italy, Odoacer deposed the last Western Emperor Romulus Augustus in 476AD, which is considered to mark the fall of the Western Roman Empire. The photographs of the coins I reviewed clearly show the puppet Emperor Libius Severus III (461-465AD) was rather common in the hoard. This established that the hoard is from this period forward meaning it was a stash place for someone during the fall of Rome. Obviously, the person did not live to come back to retrieve his coins. These coins are worth probably $1 million+ depending upon the emperors in this entire batch which might be discovered. It could possibly rise to at least the $2 million valuations.